Going on a hut ski trip is one of my favorite things to do in the mountains. 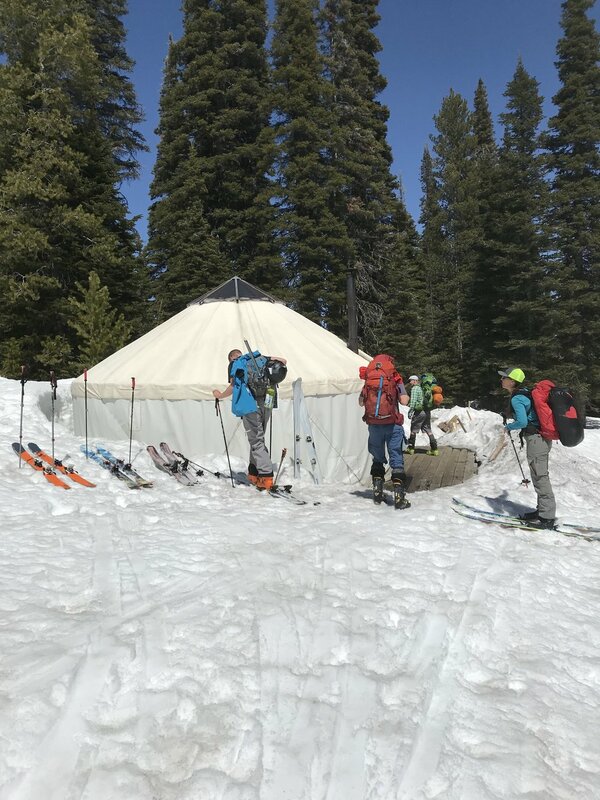 Staying in a yurt or cabin stocked with firewood, cooking equipment, and sleeping bunks makes winter and spring snow camping much easier and more fun than sleeping in a tent. Generally these huts are in the middle of quality alpine ski, snowboard, snowshoe, and nordic ski terrain and sleep anywhere from 6-12 (or more) people comfortably. 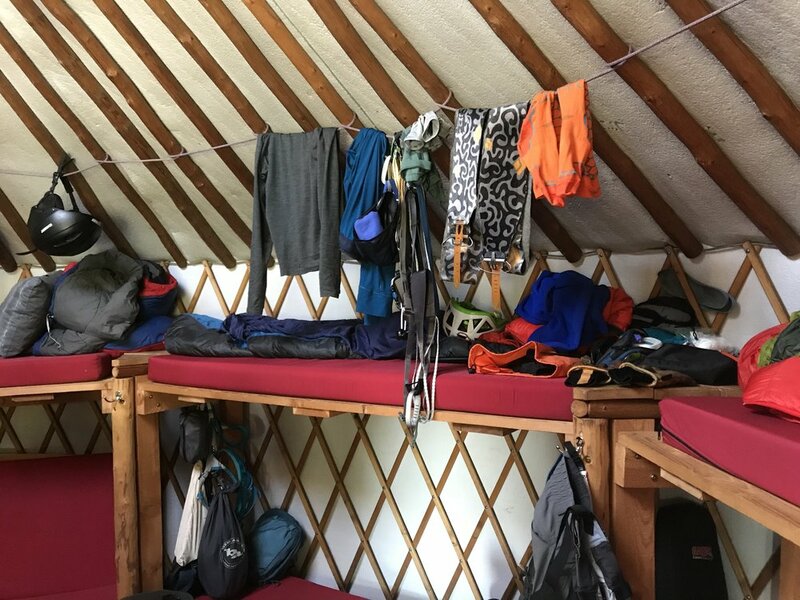 Last December I was investigating hut rental options in Oregon and Idaho and ended up stumbling upon the website for Sawtooth Mountain Guides, who rent several yurts for private and guided trips. After a bit of searching, I decided to book a 4-day/3-night guided trip with this outfit, starting in Stanley, Idaho, and heading up into the Sawtooth range to learn advanced ski mountaineering skills. 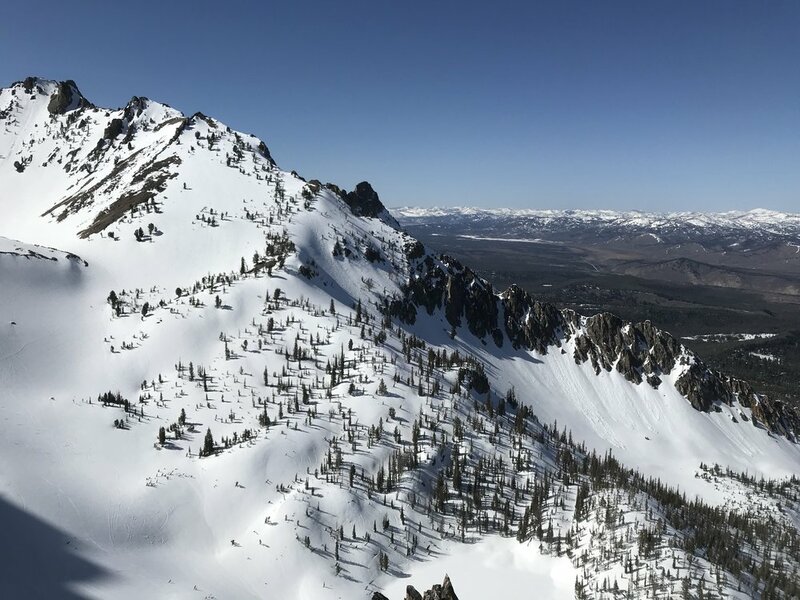 While I have a decent amount of ski experience in the backcountry, I have yet to ski any serious or committing lines and was really excited to learn techniques like belayed skiing, rappelling into couloirs, building snow anchors, and about springtime avalanche concerns in steep terrain. This trip was set to be a big step forward for my ski touring and once I booked the trip in December I couldn’t wait for late April to arrive. The launching-off point for this trip was Stanley, Idaho, population 63, about a full day’s drive from Bend. Leaving Wednesday morning, I made time east on highway 20, turned north on small roads, drove toward the small town of Banks, hooked a right, went through Lowman, found highway 21, and rode it into Stanley by early evening. First matter of business was gassing up and a close second was eating the supper I had packed that morning in Bend. As is typical on roadtrips, I hadn’t eaten much all day, and was ready to chow down. I cruised the dirt streets on Stanley and while it appeared I could have found a restaurant, the town was very quiet, and I was happy to have planned my meal ahead. Settling on the city park perched about town proper, I sat on a bench and watched the lowering sun illuminate the Sawtooth range while I ate supper. It was quite breezy and started to get chilly so I figured I needed to get on a find a place to sleep. A few miles outside Stanley I guided Karen into a mostly-empty campsite on the bank of the Salmon River, quickly rearranged the back for sleeping, and settled in for well-deserved rest after a long day of driving. Thursday morning dawned frosty, I quickly ate the food I brought with me for breakfast, and drove back into Stanley to look for a cup of coffee. A restaurant was open, and inside another group of folks looking suspiciously like fellow ski camp participants were finishing up their meal. After my coffee I quickly found the SMG office in Stanley, went inside just before 8am, met the guides and fellow ski campers, and picked out a folding chair for a short safety briefing and icebreaker meeting. Head guide Chris Lundy spoke for about an hour, when he was done we packed lunch, and headed for the Stanley ranger station to begin our trip. Once at the station we did our final preparations, strapped skis to our packs, and started off the trail on foot. After 90 minutes of walking, we stopped in the shade to have lunch and rest for a spell before transitioning to skis and skinning the rest of the way to the hut, arriving 3 miles later under a blazing afternoon sun. We had three guides: Chris and Sara Lundy on skis, and Jamie Weeks representing the splitboard contingent. Throughout the trip we would rotate through guides, picking up tips and tricks from each, and learning different ways to accomplish our shared goal of moving quickly and safely through the mountains. I can’t say enough about our guides and camp chef/fixer Skylar, they really made the trip special even confronted by less-than-ideal snow and climate conditions. The Lundys and Jamie were eager to make the best of what Mother Nature gave us to work with, and while it was obvious they wanted to get the group into higher consequence terrain all weekend, they didn’t bow to any real or imagined pressure, keeping everyone entertained with on-snow clinics and instruction in lieu of steep skiing. Also I cannot say enough about Skylar as it is impossible to imagine the experience without his support. From portering huge loads of food to cooking to splitting wood and melting water, this guy is awesome and made this trip really feel like a vacation! Thank you Skylar! After a short hut life orientation we split into three groups, headed for “Skier’s Summit.” On the way up, we practiced kick turns, ideal uphill pacing, and maintaining proper distance behind the skier leading the skin track. Atop the summit, great views of Williams Peak inspired a lot of stoke for the next three days as we checked out distant lines we hoped to climb and ski in the near future. Finally we descended the slurry of heavy, wet snow back to the hut, it wasn’t pretty, but knee joints remained intact and appetites were stoked for supper. Evenings in the hut were full of good times and good food as we all gathered in the main yurt to swap stories and sample Skylar’s excellent camp cuisine. After dinner the guides had a short meeting in the sauna, made their plan for the following day, and shared it with us before turning in for the night. I always take earplugs and an eye mask for sleeping in communal spaces, and even though I probably didn’t need them after such a long day, I slept well on a top bunk, looking forward to our first full day in the Sawtooths. During Thursday night’s meeting our guides discussed the challenge facing us in regard to the rapidly warming snowpack and potential for rockfall and avalanches in the terrain we were hoping to access. With daytime temps in the 60s and a weak overnight freeze, an early start was essential find in order to find decent ski terrain and to keep the group safe from objective hazard. So back to Skier’s Summit we went, splitting up on top and skiing several short but steep north-facing lines. These were still in the shade so the snow was quite firm and featured interesting jump turning around chunky blocks of old avalanche debris. Before I knew it the run was over, our group of 6 skiers regrouped in a safe, flat spot, transitioned to uphill mode, and worked on exiting the drainage and getting back to the hut. The sun was out in full force and the snow was quickly turning to sugary syrup under our feet. We started to hear rockfall and see avalanches rush down distant rockfaces, happy to be smack in the middle of a safe zone headed for well-deserved lunch. Unfortunately, on the way back, a fellow skier had a binding malfunction and broke the toe pin clean off his toepiece. As a result he was unable to click into his skis, we tried various fixes using straps, but nothing would hold long enough to permit travel. Ultimately, Chris Lundy gave up his skis to this camper and he bootpacked back to the hut. Friday afternoon out guides did a clinic session on the snowfield outside the hut. Under the glaring sun we practiced building deadman anchors, belaying a skier, and rappelling. It was nice to practice these skills in a controlled environment with expert instruction before using them in high-consequence terrain tomorrow or another time in the future. 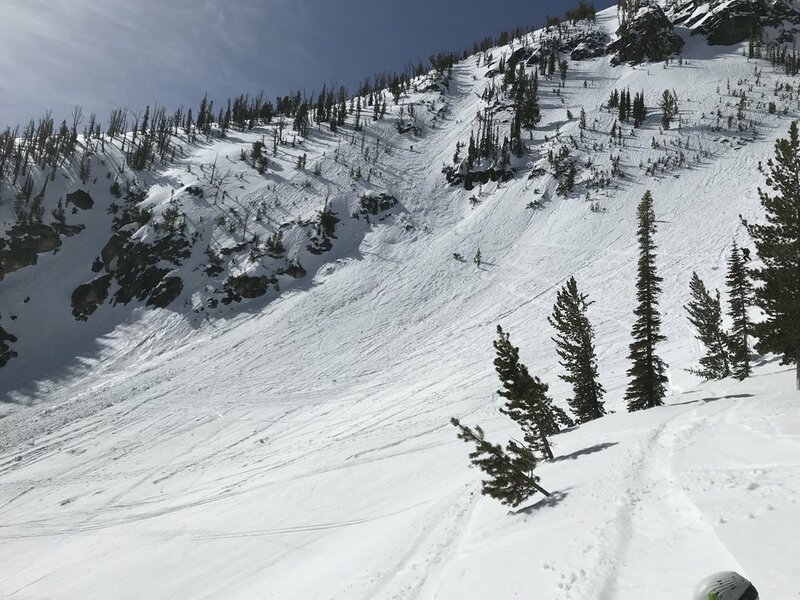 Friday evening passed without incident, but with the forecast looking meager, we basically were told that we would not be getting out into any serious terrain on Saturday and to prepare for a day of skills practice on the slopes surrounding Skier’s Summit. Up around 5am for coffee and breakfast, the group gathered under dawning skies to practice self-arrest on somewhat firm snow outside the hut. We put some decent trenches in the snow that enabled fast sliding on our bellies and back, feet first then head first, gaining valuable experience with our ice tools and confidence at stopping a potential slide for life! 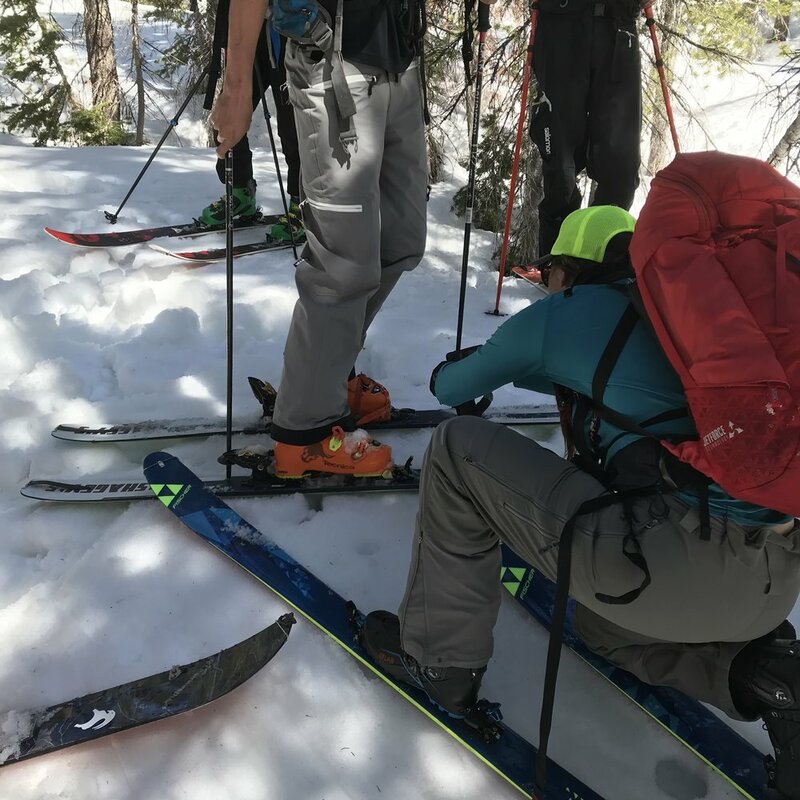 While the group was doing this, Skylar trekked back toward the trailhead with the damaged ski from yesterday, swapped it out for a fresh pair, and delivered them to one very happy ski camper. Once again forming three groups, we headed up to find some rocks to play on, build anchors, and rappel off. I had never rappelled with skis on my back and this proved to be a great opportunity to learn this skill in a fairly low-consequence environment. Then it was time to build some anchors, belay our fellow campers, and simulate a controlled lower into a steep and spicy couloir. As was the theme of the trip, by this time in the afternoon, the snow was wet mush and the most dangerous part of the day was the ski back to the yurt. The final night of our trip was highlighted by a thorough avalanche discussion led by Chris with ample contributions from Sara and Jamie. Sunday started out much the same as the other days, early coffee and breakfast, then a short tour up to Skier’s Summit and ski down through our tracks from the prior 3 days. We then cleaned the hut, packed our bags, and started down the skin track toward the trailhead. Switching to walking after a few miles, we completed the mostly downhill hike to the cars by early afternoon. After a round of goodbyes and thank-you it was time to start the long drive back towards Bend, but not without first stopping at Kirkham hot spring. It felt great to sit in the steamy water and wash off the grime from the previous 4 days. Refreshed, I made it to the Owyhee River by sundown, had myself a Karen bivy, and slept very well in the quiet interior of the car. The following morning I did a bit of fishing, trying to hook one of the Owyhee’s big brown trout. Maybe it was the fatigue from the previous few days, but my heart wasn’t in it, and I only fished for a few hours before calling it and packing Karen for the last push home to Bend. 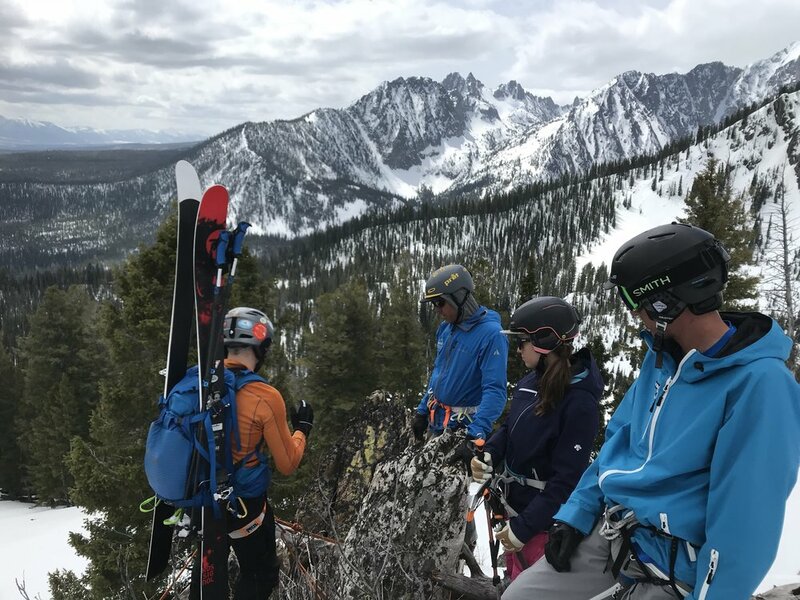 Overall, I had a great time exploring a tiny slice of the Sawtooth range with the guides and staff of SMG and hope to go back next spring to try and tick some proper ski lines. If you're looking for a guide company to facilitate a great time in these mountains, look no further than SMG. I felt like I was in great hands the entire trip, that the guides genuinely wanted to get into spicy terrain with us, and were devastated when the weather and snow conditions did not coöperate. 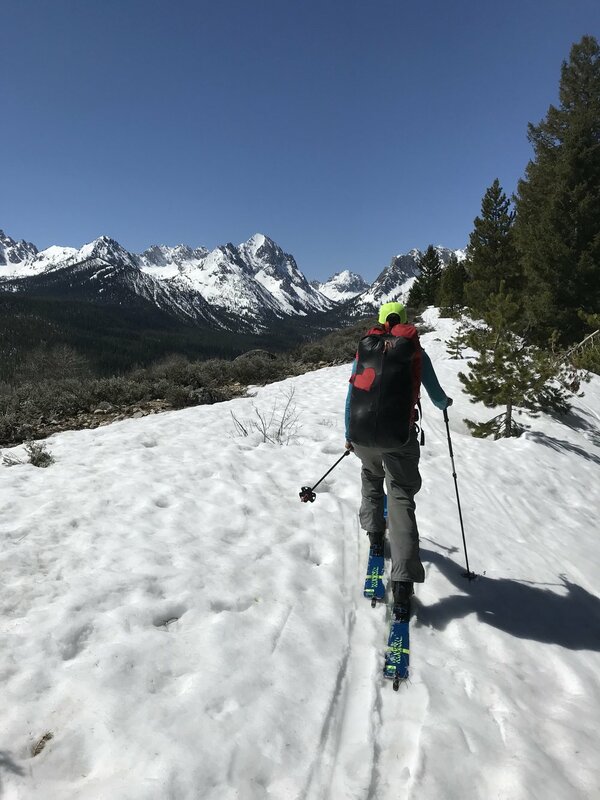 I wholeheartedly recommend this trip if you're an advanced skier, comfortable on variable terrain, and looking to develop the skills to keep you safe while exploring challenging new areas. Given the right mix of weather and snow this could be an absolutely epic experience, all the ingredients are here, it's simply a matter of having a bit of luck to combine them properly on the right days-and boom! Again, major thanks to the entire SMG staff and my fellow camp participants for making this trip a memorable one.